Worth a click. I wasn’t aware that yawning was one of the great unsolved problems of science. A dentist from the University of Maryland School of Dentistry (Gary Hack) and a Princeton postdoc (Andrew Gallup) claim that we don’t yawn because we’re tired, sleepy, or need more oxygen. No, they say, we yawn in order to cool down our brains. Ah, so that’s my problem. I’m overheating. I knew this word count thing was getting out of hand. Hack says the sinuses function as a sort of bellows system, fanning cool air into the brain. Excessive yawning appears to be symptomatic of conditions that increase brain and/or core temperature, such as central nervous system damage and sleep deprivation, says Gallup. Gallup tested his theory on rats, measuring their brain temperatures before, during and after yawning, and found that indeed yawning cooled their brains. One woman suffering from excessive yawning took oral temperature before and after yawning and found that indeed, her brain had cooled off when she yawned. After receiving that information, the woman reported that methods of behavioral brain cooling provided relief and or postponements of her yawning symptoms. I sure would like some more info on those “methods of behavioral brain cooling.” Do you think it involves sticking something in your ear? But don’t panic yet. Most garden-variety yawning probably doesn’t indicate central nervous system damage or the onset of MS. It might just be that you’re adjusting to the seasons. In another study, Galluop went to Arizona and stopped random pedestrians in the street, showing them pictures of people yawning. As everyone knows, yawning is contagious. He found that more people yawned in the winter months than in the summer, when the outside air temperature was at or above body temperature (98.6 F). His correlation held even when factors like humidity, time spent outdoors and the amount of sleep the night before were taken into account. The researchers concluded that warmer temperatures provide no relief for overheated brains. Winter is upon us. Does that mean we’re entering prime brain-use season? Do people think better when it’s cold outside? Should we keep indoor temperatures a few degrees lower in order to boost mental productivity? The study doesn’t give any specific advice. 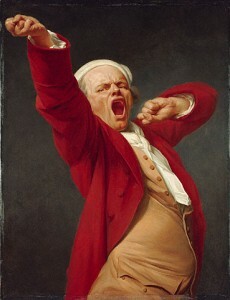 It also didn’t illuminate the mystery of why yawning is contagious. As I yawned my way through our writing group on Monday, fellow writer Liz started to join in, putting her sinus-operated bellows to work in formidable fashion. I’m not excluding the possibility that her brain needed cooling down, we work hard in our group, but how much of her yawn was a genuine physiological need and how much was she just unconsciously following my good example? I dug a little deeper and discovered that babies start yawning in the womb at as early as 11 weeks, but it’s not until they reach about 4 years old that yawning becomes contagious. (Autistic kids apparently don’t “catch” yawns like normal kids do, btw.) By mirroring my yawn, Liz was being empathetic, like the good friend she is. Studies have shown that just looking at the eyes of a yawning person can trigger a yawn, as can reading about yawning or even thinking about it. There is some thought that mirror neurons might be involved. I can verify that observation. As I’m typing here, my sinuses are bellowsing to beat the band. What I’m hoping is that once I’ve finished the post, my brain will be cooled off dramatically, and I can do some really killer writing. If you haven’t already yawned while reading this gripping post, watch the video below for a tougher test. This entry was posted in Humor, Science, Writing and tagged brain, NaNoWriMo, yawning by gydle. Bookmark the permalink. Hmm! My brain has overheated wading through the above. Perhaps I should go for a run to clear the neural steam, or does running heat the brain even further, and what happens when my sinuses are clogged, causing a breakdown in the air (brain) cooling system. Still, I know from years of experience that my problem-solving capacity was enhanced while running, rather than when I was corralled by the piles of work on my desk, so maybe the open-air exercise had a ventilating effect on the grey matter, equal to or greater than yawning. Yo Mary, I’ll accept the blog as a nose-thumbing salute to obscure and possibly meaningless research. Which reminds me I have been donating to research into causes of a particular disease for nigh on 30 years, and have witnessed little progress in finding better treatment for the affliction. Can’t help wondering how many research careers have been funded by all the donations over the years. Kudos for funding scientists! That’s awfully thougtful of you, given the lack of progress. I think running does cool down the brain, but that’s probably heat transfer through the top of the head? Who knows. When your sinuses are clogged, you’d better keep a critical eye on your brain output. It could be suspect due to overheating. (Yes, I am thumbing my nose at possibly meaningless research and equally overeager media offices at unversities…) What I found amazing was the paucity of images of people yawning on Google. Tons of animals yawning, but not too many people. Is it hard to catch someone in a true yawn, I wonder? I did a belly laugh — and learned a lot in the process. Thanks for this!